HELENA, Mont. 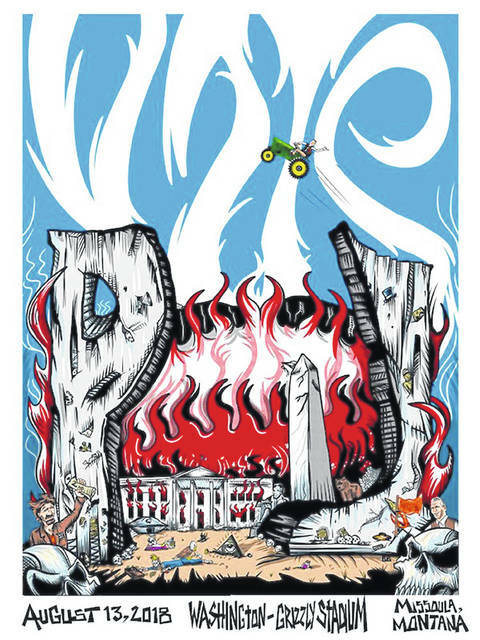 (AP) — Republicans on Wednesday condemned a poster by Pearl Jam that shows the White House in flames and a bald eagle pecking at a skeleton they say is meant to depict President Donald Trump. The rock group’s Twitter account says the official poster from Monday’s concert in Missoula, Montana, is a collaboration between bassist Jeff Ament and Bobby Brown, an artist also known as Bobby Draws Skulls. The “Rock2Vote” concert aimed to encourage young people to vote in the November midterm elections and support Democratic U.S. Sen. Jon Tester of Montana, who is from Ament’s hometown of Big Sandy. The poster shows Tester in a tractor flying over a burning Washington, D.C., framed by the letters “P” and “J,” with smoke forming the word “Vote” in the background. Tester’s Republican opponent, Montana State Auditor Matt Rosendale, also is depicted with a crab claw for a hand and carrying a “Maryland” flag, a reference to Rosendale’s native state. The National Republican Senate Committee, which is supporting Rosendale’s campaign, also blamed Tester for not speaking out against the poster it called “gory.” The committee compared it to other examples of public figures “encouraging violence” against Trump, like Griffin’s photo. Pearl Jam was traveling Wednesday and not immediately available for comment, according to Whitney Williams, a publicist for the Missoula concert. Ament told The Associated Press in April that the band wanted to use the Montana concert to support local advocacy groups, encourage voter participation and boost Tester’s campaign. He said he believed that the political climate had become too divisive. “Probably more than ever it’s important to have a congressman that can sort of make people think less emotionally about some of these things,” he said.